Do you have a family game night? Our family does and we find it to be a great way to connect as a family. USAopoly has the most unique game sets out there. They have been creating game sets since 1994. They are not your typical games though these have a twist. They feature classic characters like Ghostbuster's and My Little Pony's as well as new favorites like Steven Universe and The Walking Dead. What gaming super hero do your kids like the most? My kids love the classics we still have the first Nintendo that came out. 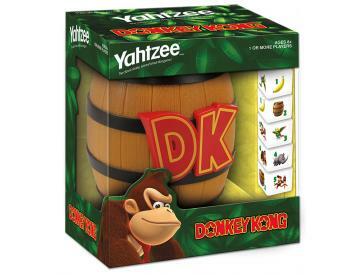 We received the Yahtzee Donkey Kong and Monopoly: Super Mario Bros. Collector's Edition. These games were a lifesaver. My middle child Gavin had to have stitches; he busted his head open in gym class at school. I wanted something to keep him occupied that wasn't to active. We played Yahtzee Donkey Kong and he loved it. The game was super simple for him. 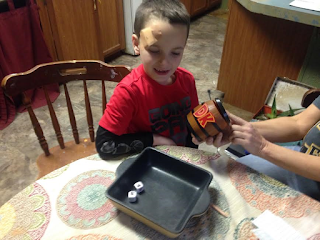 All he had to do was role the dice and it kept him so happy and entertained. I didn't have to worry about him running around playing and getting his stitches busted back open. He loved the Donkey Kong barrel that you shake the dice in when you role. My oldest loves Monopoly in general and Mario. I knew he would go wild for Monopoly: Super Mario Bros. Collector's Edition. 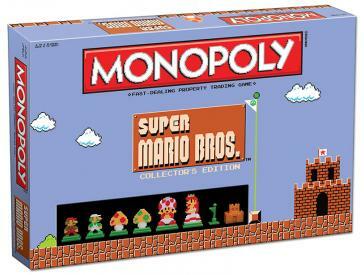 The Super Mario Bros. Collector’s Edition of Monopoly lets players buy, sell and trade locations from the eight worlds featured in the classic 8-bit version of the 1985 video game. 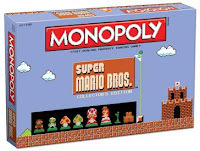 We loved the custom 8-bit styled game pieces complete the classic styled Monopoly game with an original Super Mario Bros. twist. Christian my oldest always wants to be Mario.